This weekend saw me revisit some old friends. I say friends because I feel like I know them, even though they don’t have a clue who I am. In fact you probably know them too as The Rolling Stones. I had been in California last year to see them at an event called Desert Trip, where the combined ages of the performers, who included The Who, Bob Dylan, the aforementioned stones, Paul McCartney and several more reached well above a thousand. Watching Charlie Watts on the big screen my wife and I quipped about what he was thinking. “Ooh I could murder a cup of tea and a biscuit.” “I hope the missus has recorded Corrie”. With his silver hair and brilliantly expensive white teeth, he also sat bolt upright at the drums, with a composure and dignity that many of half his age would die for. 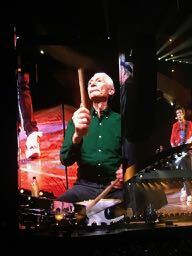 Born in 1941 Charlie Watts will be 77 next year and with Ronnie Wood being the baby of the band at 70, you have to ask, how do they do it? Keith Richards has, over the years consumed several times his own weight in recreational drugs and still starts every day with a joint. I suspect that the answer lies in the manner in which they live their life and the passion to which do their work. Being multi millionaires doesn’t hurt of course, as money is the key element to longevity the world over. But watching them all on the stage the other night, it was clear that they all still get a terrific buzz from what they do. The sheer joy that they exude is not something you can fake and from start to finish they did nothing but entertain at full pace. There aren’t many of us who will have the opportunity to experience the adrenaline rush of playing to 60,000 adoring fans, but perhaps the secret to a long life is to live a life where you experience fulfilment of a passion. On top of that, not one of them stopped moving for over two hours on stage. Mick Jagger moves as a 74 year old more fluidly than I could hope for at 54 and probably hits his 10,00 step target in one show. Following him on Instagram, he is regularly posting videos of his dance workouts and training and seeing him live you know he’s not faking it. “When you rest you rust,” my Auntie Joan used to say to me. Until her death at 89 she shouted at squirrels, me and the cat and got out into the garden every day if only to see what the gardener had done wrong. I live lived to the full is a life lived. Move every day, find a passion. Mick and the boys are living proof of its effects.